Ready to Open Your Home and Heart But Have Questions? If you have a place in your home and heart, please consider fostering for RMGDRI. When you decide to foster for RMGDRI, you have taken a major step in saving a life of a Great Dane. Foster homes allow us to put Danes we have received into a good situation where they will receive love, attention, and in many cases recover from medical issues. Foster homes are one of our greatest needs. The more foster homes we have, the more Great Danes we can save. If you still have questions, please read on. 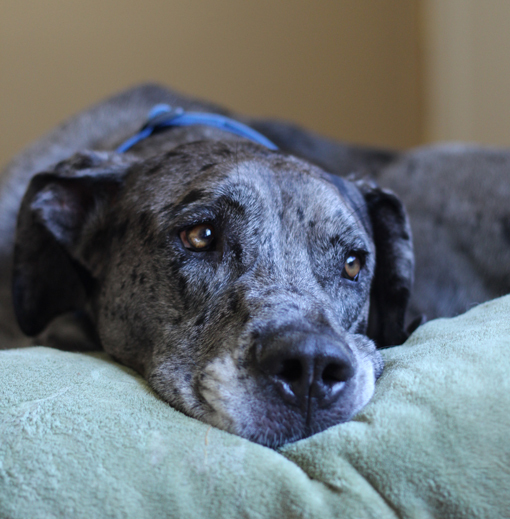 Foster care is a a temporary refuge for a Great Dane who needs a new home. It is a place for a dog to become better socialized, learn house manners and basic obedience skills, and obtain medical attention as needed. The foster family can also evaluate a dog’s temperament for placement. By placing a Great Dane in foster care, we are able to successfully assess, treat and rehabilitate them for their future forever home. Who pays for foster care? As a foster you will pay for toys, dog treats, cleaning supplies, and mileage as they are not reimbursed by the Rescue. Remember to check with your tax advisor about deducting mileage as a charitable expense. How long is a dog in foster care? Our Danes can stay in foster care anywhere from a week to a couple of months. In rare cases, more time is needed. On average our dogs stay in the care of their foster family for 90 days. What if the dog does not fit in? What type of support can you expect to receive? We support our fosters tirelessly. You will have an email list full of people who have been rescuing Danes for a long time to lean on. Our Board of Directors are just a phone call or email away. We have a dedicated Foster Director to answer any of your questions. Our Vet Coordinator and Veterinary partners will help with any medical issues. We also offer training help with any behavior issues that may arise. How can you let them go? Fostering for RMGDRI has been the most rewarding experience of my life. It is an incredible feeling to know you have actively participated in saving and rehabilitating an animal that would have otherwise been forgotten. Whether they are with me for only a day, or for a few months, they all have left a permanent mark on my life. I am incredibly grateful for this experience. You bring a broken creature, both in mind and body, into your home and send a confident, loving creature put into the world. You create a safe, loving haven in a sea of turmoil and despair. At the end of the day, you create a family member – they are not just a dog anymore. To see a dog I have fostered with their new Forever Family, to see the joy on everyone’s face, to know I’ve been a part of it is quite simply the most amazing feeling in the world. Fostering for RMGDRI has been a way of paving my way to Heaven. By giving my time and love to these beautiful animals, for however long they are with me, I in return have learned the true meaning of selfless love and patience. And this I have gotten from their love and companionship. Seeing their personality come out is so rewarding and the people here supporting me are wonderful. People are often scared of Danes initially due to their size, but they grow to love them once they get to know their goofy personality and gentle spirits.